Read About the History, Vision and Mission, and Philosophy of Cypresswood Montessori School! “I, Sahera Nasser, have been in Early Childhood Education for the last 30 years! When my youngest son was born, the love for Montessori Education was inspired in me. I took the training in England and taught there for several years. After moving to Texas in 1994, I was involved in founding a private school in the southwest part of Houston. I was a Principal there for six years. Then in 2002, I decided to open my own Montessori School in Spring, Texas and I am living the dream now! The attainment of peace through the preparation of a child. The mission of Cypresswood Montessori School is to prepare an environment that supports and facilitates individualized learning for children. Our loving, nurturing staff helps students develop their self-confidence, strengths, potential, and respect for cultural diversity in order to build a peaceful world. Cypresswood Montessori School is a private, co-educational school located in Spring, Texas within a planned community. Our school is a 7,000 sq. ft. facility with a large indoor gym, a theater for dramatic play, and a huge outdoor playground. The school was established in January 2002 and is bright, clean, and pleasant. Our staff has to earn a certain number of hours of training. Here, we go beyond the required hours! Cypresswood Montessori School welcomes children of all cultural, educational, ethnic, and religious backgrounds to BUILD A PEACEFUL WORLD. The Montessori teaching philosophy was first developed by a European doctor by the name of Maria Montessori. The foundation of the philosophy is that every child develops at their own individual pace and level. While developing, every child deserves to be treated with respect and provided with choices and interesting alternatives with which to develop their learning potentials. Below are some basic concepts and core areas of concentration which are closely followed within the Montessori Method of teaching. The Montessori classroom is more teacher-initiated versus teacher-centered. The teacher’s role in a Montessori classroom is to maintain order and each student’s self-discipline, along with directing the children towards solving their own questions through Montessori materials and the use of feedback from their peers. The child is an active participant in the learning process. The use of manipulative materials is very important in the Montessori classroom. 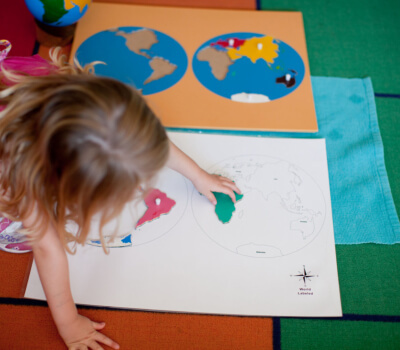 The Montessori method is built upon allowing children to discover questions and find the answers themselves. This process enhances the development of their cognitive and problem-solving skills. The Montessori classroom highlights the social interaction between the different age groups. The classroom facilitates several age groups working together at one time. For example, in the 3 to 6-year-old classroom, the older children act as role models for the younger children, while older children experience a sense of responsibility and importance. The Montessori method, out of respect for the individual child, provides education on real-life experiences and responsibilities. It is common for a 3-year-old child to go through the process of obtaining a snack for herself. She takes a napkin and a cup to the snack table to enjoy her snack with her classmates. She pours herself some water from a pitcher. After finishing her snack, she clears and cleans up her spot. The child has been taught the individual steps to the process of getting her own snack, as well as the responsibility for cleaning up after she is finished so that the next person is allowed the same opportunity. All of this occurs with little intervention from the Montessori teacher. The daily routine of the child relies heavily on their own individual interests and choices. The teacher closely supervises to ensure that, over an extended period of time, each child is exposed to all essential areas of the curriculum in the classroom. A typical Montessori program thrives and depends on parent involvement and support. It is very important that each parent understands the experiences that their child goes through each day, in addition to the philosophy and teaching behind those experiences. An open channel of communication between teachers and parents is critical to the success of any Montessori program. The Montessori method works to instill an excitement towards learning with each child and to develop their own internal motivation for continued learning. A Parent is the most important person in our center. Parents are our only customers. A Parent is dependent upon us and we are dependent upon Parents. A Parent does us a favor when she calls. We are not doing her a favor by serving her. A Parent is not an interruption of our work. Parents are the purpose of our work. A Parent is a part of our center – not an outsider. A Parent is not a cold statistic. A Parent is a flesh-and-blood human being with feelings and emotions just like our own. A Parent is not someone to argue with or match wits. A Parent is a person who brings us his needs. It is our job to fill those needs. A Parent is deserving of the most courteous and attentive treatment we can give. A parent is the lifeblood of this center. We serve Parents by providing quality care for their children! Cypresswood Montessori School is proud to inform our students and parents that we have been recognized by the International Montessori Society. Feel free to contact us through these contact details if you have any questions or concerns.